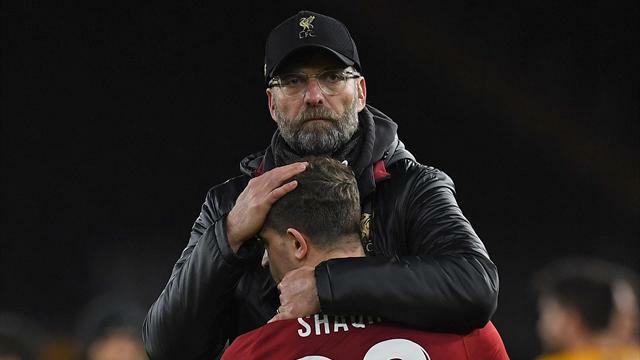 Liverpool manager Jurgen Klopp hopes his central defensive injury problems should be cleared up soon, with Dejan Lovren joining the growing absentee list as the Premier League leaders prepare for Saturday's test at Brighton & Hove Albion. Croatian centre back Dejan Lovren picked up a muscle injury early in Monday's FA Cup third round defeat at Wolverhampton Wanderers to add to the absence of two other central defenders Joel Matip and Joe Gomez. Klopp said Matip was back in training and suggested that Lovren could be back after the January 19 game against Crystal Palace. "They are not out for long. It's not cool in this moment but in two weeks it will probably be okay," he said. "We are fine. A season is always like this. Who deals the best with their problems has the most success." "Joel trained yesterday for the first time with the team which is really good but we have to see and decide day-by-day," he added. The German indicated that Brazilian holding midfielder Fabinho could again fill-in alongside Virgil van Dijk and noted it was not a major shift for him to drop deeper. "If Fabinho has to play as a centre half what we want is the natural understanding of the game," he said. "If you are a holding six (midfielder) or a centre half with the ball it is easier," he added. Liverpool's defeat at Manchester City leaves them with just a four point advantage over Pep Guardiola's side but their loss to Wolves leaves them with one less competition on their schedule. Asked whether that would give Liverpool an advantage over their rivals, Klopp said that depended on how well they made use of the extra preparation time. "There's no advantage. You can do a lot of wrong things when you have a week to train. That is possible. We have to use the time and understand the challenge right," he said. Klopp, whose team are also out of the League Cup, conceded however that he does prefer to have the opportunity to train more with single game weeks. "It's my preferred rhythm. It's our situation, it's not that we decided to go out of the cups. We got Chelsea at home, we got Wolves away and had to make changes because of the intensity of the games," he said. "Pep said he would prefer to be in all four competitions and I'd prefer the same. We have to make the best of the time we have now and get as many points as possible. "Hopefully we don't have a lot of normal weeks because we want to stay in the Champions League as long as possible."